The Stathos memorial bikeway, the shoulder of the road out of Medford, looks much the same as when it was dedicated in 1979. 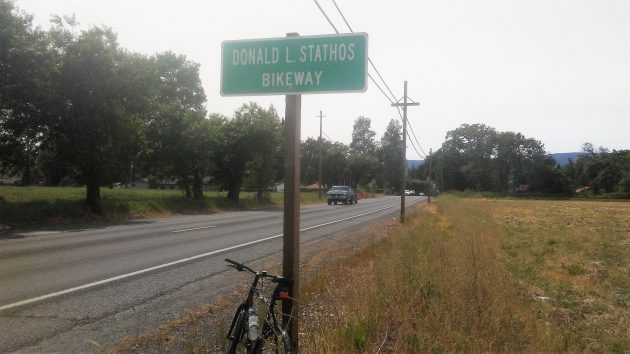 I think of Don Stathos, whom I knew a little back in the seventies, every time my bike takes me on the road between Jacksonville and Medford, as it does occasionally. Don was an insurance agent in private life, and he would often ride his bike between his home in Jacksonville and his Medford office. The bill he authored — and Gov. Tom McCall signed — was the first of its kind to be enacted in the United States. It requires that when roads are built or rebuilt, at least 1 percent of the budget be spent on making sure that the projects accommodate the needs of people on foot and on bikes as well as those in motor vehicles. In a case from Portland, the Court of Appeals upheld the intent of the law in 1993. Don Stathos died in 2005. His bike commuting route had been dedicated in his honor in 1979. Signs on the route, and a plaque on the ground that is hard to find, remind people who care of his contribution to sensible transportation policy. We haven’t had constructive legislation like that for a while. Bills that make bike commuting easier, such as treating stop signs as yields, have been proposed and rejected. In the current session, there’s not a single transportation bill to encourage bike riding for short trips, which would save on wear and tear on pavement and the expense of street repairs. Instead, legislators are thinking of putting an excise tax on the sale of new bikes to raise money for bike lanes. That’s like slapping a sales tax on shoes to help pay for sidewalks. He may spell his name wrong, but, we are lucky to have a Republican in the same mold as Don Stathos and Tom McCall in Andy Olson. He has done some great things lately for the Marshalise people who live here in Oregon. Again, we are lucky to have Andy as our State Representative.